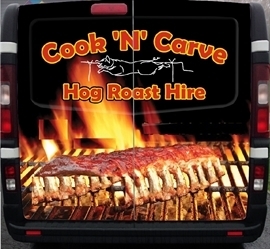 We have years of experience that we are more than happy to share to make your Hog Roast an event to remember. 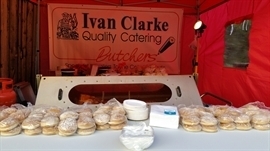 Ivan will help you with your booking to make you event as pleasant and stress free as possible. Plated 100 to 150 servings. Baps or rolls 150 to 200 servings. 1We advise to reserve your date as soon as possible. 2Please select the option you require and make an enquiry. 3We will then contact you to talk you through your requirements. Carving Trays, extension lead, gas lighter, and operating manual. If you require we will set the machine up and connect the gas. You supply the pig, baps and apple sauce. We will deliver and collect the machine. There is a charge of £30 if the machine is not cleaned. Hog Roast Machine and Pig. An operating manual complete with cooking instructions. Full bottle of gas, Carving Trays, extension lead and gas lighter. Average cost per head for 150 people is £2.30p per person. You supply the baps and apple sauce. There is a charge of £30.00 if the machine is not cleaned. 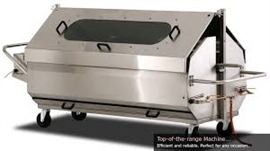 This package also comes complete with a Gazebo, Serving Tables and Carving Board. We will also supply the baps, apple sauce, paper plates and napkins. On Delivery we will erect the Gazebo, set up the Machine and connect the gas. After your event we will collect the equipment. Let us take the strain and organise your event for you. We will turn up at your event at a time that is convenient and does not disrupt your guests. 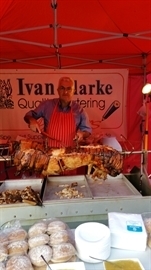 Our skilled butchers will set up and carve the hog ready for your guest at the time you require service. We will provide everything required and serve your guest. After service we will tidy up quietly and remove all waste. Average cost per head for 150 people is £4.30p per person. This option price is for up to 150 guests. We can cater for up up to 400 guests. Please ask for a quote if your event is over 150 guests.